This year marks the 175 birthday for the township of Gawler. This is a substantial achievement - Gawler is one of the oldest towns in South Australia. The main street will be transformed with colourful and celebratory street banners and many events are planned to honour Gawler’s unique and esteemed history. To help get the community involved in organising commemorative events for this occasion, the Gawler 175 Events Community Reference Group has been established. Initiated by Gawler Council, this Group is helping local groups develop and promote activities this year that will link to Gawler’s 175th birthday. The Reference Group includes Councillors and staff, and representatives of the Gawler Business Development Group, National Trust, Visitor Information Centre and the community. ‘I hope the community really get behind this and register events to mark this great occasion’ says Mayor Sambell. Events can be registered on a website the Reference Group has developed for Gawler’s 175th celebrations. This website will help the community know what’s on and where events will be held during 2014. ‘The local media is very supportive of this project and there will be lots of media coverage at all registered 175th birthday activities’ says Mayor Sambell. So far, events that are being considered for this year’s celebrations include music festivals, competitions and history activities for young people, art exhibitions and bus tours to areas that showcase Gawler’s indigenous plants. A rodeo and a Rally SA event may also be considered. Click here for the Terms of Reference. Please click here to view the calendar of upcoming events for Gawler 175. Speech at Gawler’s Apex Park Australia Day breakfast by Deputy Mayor Brian Thom [as Chairman Gawler175 Events Community Reference Group] to launch Gawler’s 2014 celebrations of the 175th year of settlement. “In the last 6 weeks, Gawler has sweltered, in up to 46c degree heat. We have had the hottest days since 1931. Gawler is now 175 years old. If you were here in 1839 how would you have coped with the heat? In 1839, there was no electricity; which means no air-conditioning and no refrigeration. There was no motor transport, no trains, no trams, no telephone, no mobile-phones, and no Ipads. There was no radio, no television, and no local newspaper….things that we take for granted today. 175 years ago, Gawler citizens were indeed a hardy lot but the burial records show that people died of Typhoid, Dropsy, Diptheria, Measles, Convulsions, Whooping Cough, and Dysentry. Many children were lucky to reach the age of 2. When the gold-rush to the Victoria goldfields commenced, in 1852, only 5 men were left behind to live in Gawler…….Canon Coombs, Dr Mahoney and 3 other men. Over Gawler’s 175 years, we have seen the first train in Gawler in 1857, the birth of the Bunyip newspaper in 1863, the Institute completed in 1871, and the Town Hall on 20Nov1878. James Martin created Phoenix Foundry where he produced agricultural machinery and between 1880 and 1890 produced over 200 steam trains. At its height of production, 700 men were employed over 18 acres of factory on and around High Street where Target is today. Then there was May Bros, located in 18th Street who also produced agricultural equipment, but more particularly they designed and made lifting winches for the BHP mines in Broken Hill. Required to lift up the ore from thousands of feet down in the ground, these winches were considered the most efficient in the world. Other notable companies include the Britannia Foundry on Barnet Road, and Thompson’s Eagle Foundry operated in King Street. Some people say that in the 1880’s, Gawler was the most industrialised town in Australia. There were many major flour Mills in Gawler. Mr Fotheringham created a brewery 200 meters away from this very spot. The Butter Factory in nearby 8th Street actually exported butter to London. In 1924, Mr Wintulich commenced his smallgoods manufacturing in Gawler. Wintulich’s mettwurst has become iconic. Today our History Team has distributed a special 2014 leaflet for you to refer to. Please make the time to google our website to learn more about the major achievements in Gawler since 1839. In recent months, your Town of Gawler Council has formed the “Gawler175 Events Community Reference Group”. A number of us meet fortnightly to explore ways to engage you, the community, in the creation and/or badging of special events, using the new Gawler175 logo. That logo appears on the leaflet given to you today. This week a special Murray Street cross-street banner will be erected and, for the whole year, will display the Gawler175 logo and the Council website that you can access. The Gawler175 Group are endeavouring to engage the youth in our many schools; in collaboration with their History teachers. I am confident that many worthwhile and interesting events and projects will evolve over the next 12 months. Please refer to the Town of Gawler website to see what community events are planned for this year. A special tribute is in order for community members Martin Johnson, Graham Tucker and Gary Iremonger; all of whom displayed much enthusiasm and provided valuable ideas and input, and each of them hardly missed a meeting. Council was constantly supported and represented by then Mayor Brian Sambell and the then Deputy Mayor Brian Thom, with the assistance of Staff members Anne Richards and Donna Aldridge. Cr Scott Fraser and community members Carolyn Potts, Barry O’Brien, and David Pedler made their valuable contribution at some of the meetings. The Group was not established to organise Celebratory Balls or re-enactments, but to encourage community pride of Gawler’s special heritage. Hundreds of Gawler’s community Groups and Clubs were encouraged to display on their communications the Gawler 175 Logo that the Group created. The public were asked to display the Gawler175 logo sticker on their car rear window. 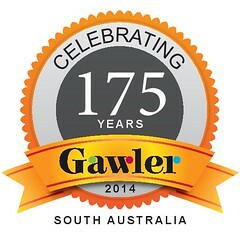 Lapel pins were created and the “Welcome to Gawler” entry signs were adorned with the Gawler175 Logo. Special Certificates were created to be presented to the parents of each child born at the Gawler Health Service in 2014. These were gladly accepted. All Groups and Clubs were asked to arrange their year’s events to be badged with “Gawler175”. Over 60 such events were recorded on the Town of Gawler website and Council staff assisted, where it could, in publicising such events. The large banner over the southern end of Murray Street was designed and installed to span the street for 11 months, displaying the Gawler175 Logo and the Town of Gawler Logo, reminding passing traffic that 2014 was Gawler’s special year. Martin Johnson’s enthusiasm encompassed the total organisation of a very successful 2 day event in the “CHANGE Original Music Festival”, which was freely supported and enjoyed by many local musicians. “Given that the Group’s Terms of Reference revolved around the production of effective community awareness, I do believe that our Group has achieved that goal successfully, with few regrets’’ said Chairman Brian Thom. Do you remember Gawler 175 Events Community Reference Group ? Then Join up and add your memory here.